Our 2007 holidays have been split between Roanoke, VA and Carteret County, NC. While we have spent some holidays on the coast before, we have never enjoyed as much time on the coast during the serious holidays as we have this year. I have been surprised at how quiet the coast becomes during the holidays. Being along the beach is almost an antidote to the hustle and bustle of the holidays in Roanoke. A lot more people seem to leave the coast to be with families than the reverse. While stores in major metropolitan areas often extend their hours during the holidays, stores in small towns along the coast sometimes close for a number of reasons, but primarily because there are not as many people around. This year I enjoyed the real Christmas trees that are allowed in Carteret County commercial establishments. I managed to go a whole holiday season without a single trip to the mall. That is pretty easy when you buy your wife a robe from LL Bean's and a cornbread pan from the local Ace Hardware. There were a lot of Amazon boxes at our Christmas celebration, but that I believe to be more of a generation thing than anything. Maybe malls will disappear before the newspapers go. My wife and I managed to go to Target, Books a Million, and SAMs for a variety of things, but fortunately our trips were relatively painless. They were more like guerrilla attacks than expeditions. We managed to catch an early Christmas pageant in Cape Carteret, Christmas music at Covenant Presbyterian, and a candlelight Christmas eve service at the Cape Carteret Presbyterian Church. All our children managed to be around our holiday table of cherry glazed pork loin so we are thankful for that and even the grand-dogs and grand-cat that made the trip. I managed a Christmas eve boat ride down the river which was just as nice as a walk in the woods on the mountain. 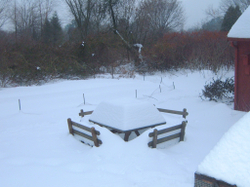 I enjoyed my white Christmas vicariously through pictures from Sally, a college friend whose Massachusetts backyard remind me of some Canadian winters we endured. That was far better than shoveling snow. Maybe as you get older, you can get past the holiday madness. Of course it helps that the girls now help cook the meals, and I do not mind washing most of the dishes. We have downsized our Christmas presents. We also have more fun with stocking presents than almost anything. I gave one of the kids a box of Mac and Cheese. I think that is appropriate for a recent (one week ago) college graduate still looking for a job. If we have downsized our holiday present expectations, we have super-sized the fellowship and friendship that we expect from the season. From neighbors in Cape Carteret to those in Roanoke and our family, we have not been disappointed. I managed to connect with everyone from my high school Latin teacher to all my Yadkin County cousins on Christmas day. I especially enjoyed being part of an office Christmas party. After all these years working remotely, it was really nice to enjoy sitting at a table of colleagues that I respect and enjoy working with during the year. It has been a wonderful holiday season even if it has gone to the dogs. After relaxing all morning, I think I'll go play with my new $99 Zonbu computer. Tomorrow I have to go back to work, and losing myself in technology is a way to put off thoughts of work. With no fan and no hard drive, my Zonbu mini is about as quiet as Christmas at the beach.